No pictures found for plate number 7HJH713 in California, United States. click here to add a picture. 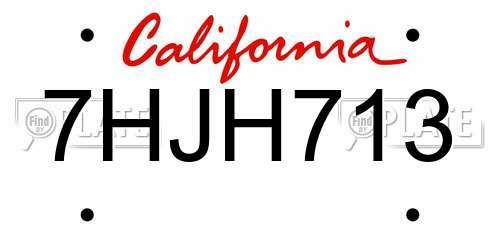 No videos found for plate number 7HJH713 in California, United States. click here to add a video. No owners found for plate number 7HJH713 in California, United States. click here to add an owner. No related websites found for plate number 7HJH713 in California, United States. click here to add a related website. EQUIPMENT DESCRIPTION: ACCESSORY DRIVER-SIDE FLOOR MATS USED IN 1996-1998 HONDA CIVIC VEHICLES. DUE TO THE SHAPE OF THE FLOOR ON THESE VEHICLES, A MISPOSITIONED FLOOR MAT COULD INTERFERE WITH THE ACCELERATOR PEDAL. THE FLOOR MAT COULD PREVENT THE ACCELERATOR PEDAL FROM RETURNING TO THE IDLE POSITION. IF A CUSTOMER HAS A GENUINE HONDA DRIVER-SIDE FLOOR MAT, DEALERS WILL INSTALL A POSITIVE FLOOR MAT RETENTION SYSTEM CONSISTING OF A GROMMET IN THE FLOOR MAT AND A PIN BRACKET IN THE CAR. OWNER NOTIFICATION IS EXPECTED TO BEGIN DURING MAY 1999.OWNERS WHO TAKE THEIR VEHICLES TO AN AUTHORIZED DEALER ON AN AGREED UPON SERVICE DATE AND DO NOT RECEIVE THE FREE REMEDY WITHIN A REASONABLE TIME SHOULD CONTACT HONDA AT 1-800-999-1009.ALSO CONTACT THE NATIONAL HIGHWAY TRAFFIC SAFETY ADMINISTRATION'S AUTO SAFETY HOTLINE AT 1-888-DASH-2-DOT (1-888-327-4236). DEALERS WILL REPAIR THE FRONT PASSENGER'S AIR BAG MODULE TO PREVENT THIS PROBLEM FROM OCCURRING. OWNER NOTIFICATION BEGAN DURING OCTOBER 1997.OWNERS WHO TAKE THEIR VEHICLES TO AN AUTHORIZED DEALER ON AN AGREED UPON SERVICE DATE AND DO NOT RECEIVE THE FREE REMEDY WITHIN A REASONABLE TIME SHOULD CONTACT HONDA AT 1-800-999-1009.ALSO CONTACT THE NATIONAL HIGHWAY TRAFFIC SAFETY ADMINISTRATION'S AUTO SAFETY HOTLINE AT 1-800-424-9393.